With one successful test flight of a private space capsule under its belt, a commercial spaceflight company is looking ahead to another big step: upgrading its robotic Dragon spaceship to carry astronaut crews. The Hawthorne, Calif.-based Space Exploration Technologies – known as SpaceX – has submitted a proposal to NASA's Commercial Crew Development (CCDev) program to begin developing a version of its Dragon spacecraft to transport people into orbit. The company submitted the proposal Dec. 13, just five days after launching the first Dragon space capsule into orbit, returning it to an ocean splashdown, and fishing the craft out of the Pacific Ocean. That demonstration flightmade SpaceX the first private company ever to recover a spacecraft from Earth orbit. 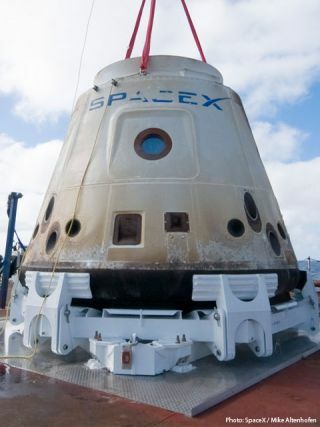 Upgrading Dragon capsules to carry astronauts won't be too difficult, SpaceX chief executive Elon Musk said in a statement released Monday (Jan. 17). According to Musk, both the capsule and its Falcon 9 rocket launch vehicle were originally designed to transport crew. "The cargo version of the Dragon spacecraft will be capable of carrying crew with only three key modifications: a launch abort system, environmental controls and seats," Musk wrote. SpaceX submitted its proposal as part of the second phase of NASA's CCDev program, which solicited proposals in October, with funding possibly to be made available this March. CCDev, along with other initiatives such as NASA's Commercial Orbital Transportation Services program, is designed to spur the development of American private spaceflight companies. NASA is retiring its space shuttle fleet this year and will rely on Russian Soyuz spacecraft to ferry cargo and crew to the International Space Station in the near future. But over the longer term, NASA wants American companies such as SpaceX to shoulder much of the load. Putting in a launch abort system — which would allow astronauts to escape Dragon in an emergency — is the primary focus of the CCDev proposal, Musk said. SpaceX's proposed design is an integrated system, which would provide escape opportunities all the way to orbit, Musk added. This design reduces costs, since the abort system would return to Earth with the capsule, he said. And the escape engines could make Dragon more maneuverable, helping to orient the capsule for precision landings. "An emergency chute will always be retained as a backup system for maximum safety," Musk wrote. The company proposes to establish specific milestones to provide NASA with evidence of regular progress as the modifications are made, Musk said. These milestones include the initial design of the abort system and crew accommodations; static-fire testing of the abort system's engines; and evaluations by NASA crew of Dragon's seats, cabin and control panel. Before SpaceX is ready to start carrying astronauts, Dragon is scheduled to fly at least 11 more times, and Falcon 9 will make at least 17 more flights, according to Musk. Dragon's next test flight could take place in mid-2011 and might take it directly to the International Space Station, Musk has said.